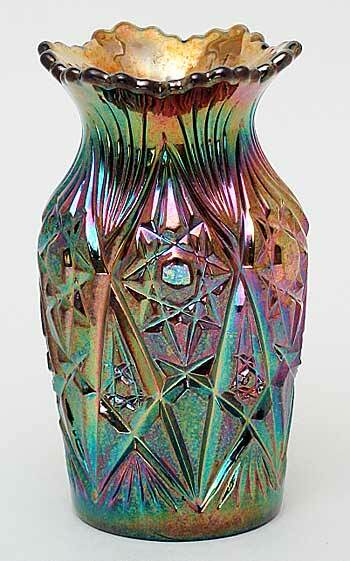 Glen and Stephen Thistlewood, in their book, A Century of Carnival Glass, report this rare vase in three shapes, incurving, flared, and waisted–as shown in a 1934 Karhula (Finnish) catalog. This blue example is 5 1/4 inches tall with a 2 3/8 inch base. It sold in 2004 for $350. A 4 1/2 inch tall vase in blue sold for $350 in 2007. In 2009, a cupped in 5-inch example in blue sold for $200.